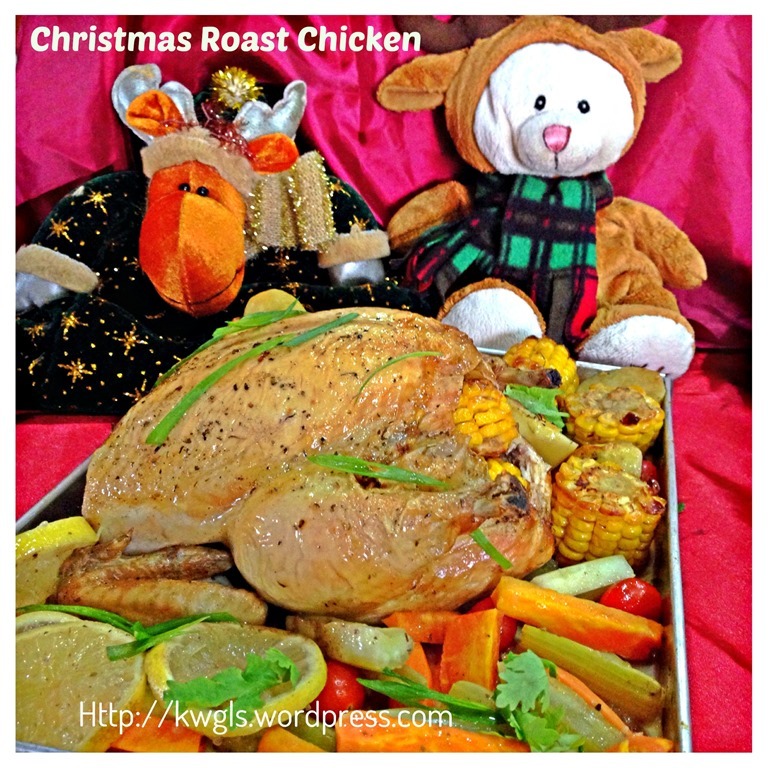 I will start my Christmas series with “Christmas 2013 is approaching…”. 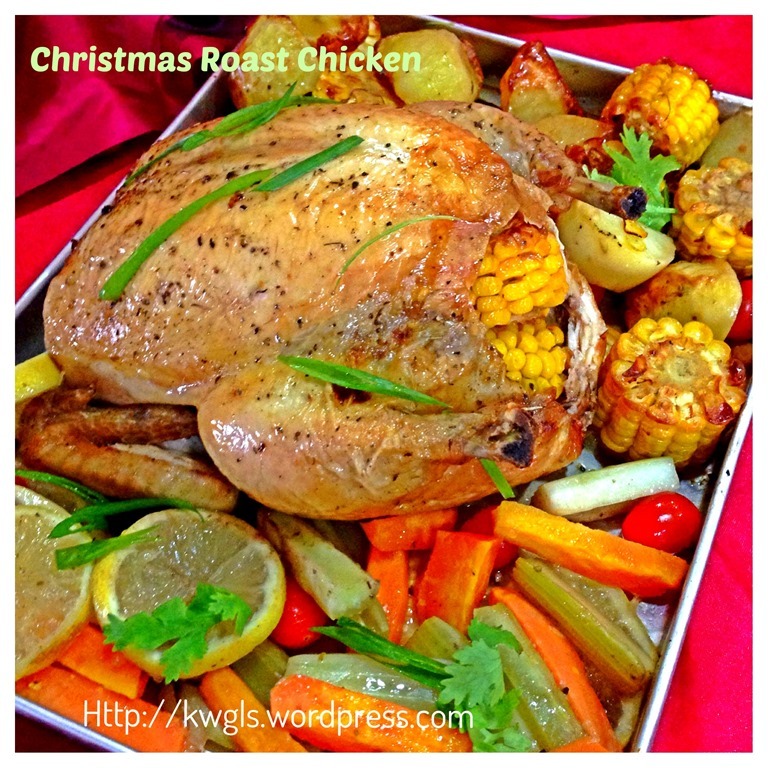 Yes, in fact, Christmas is approaching, time to get ready your fruit cakes, cookies, puddings… Since supermarkets in Singapore have started to accept orders for Christmas dinner, I do not think I am too early to share with readers some of the common delicious food items served during Christmas table now! 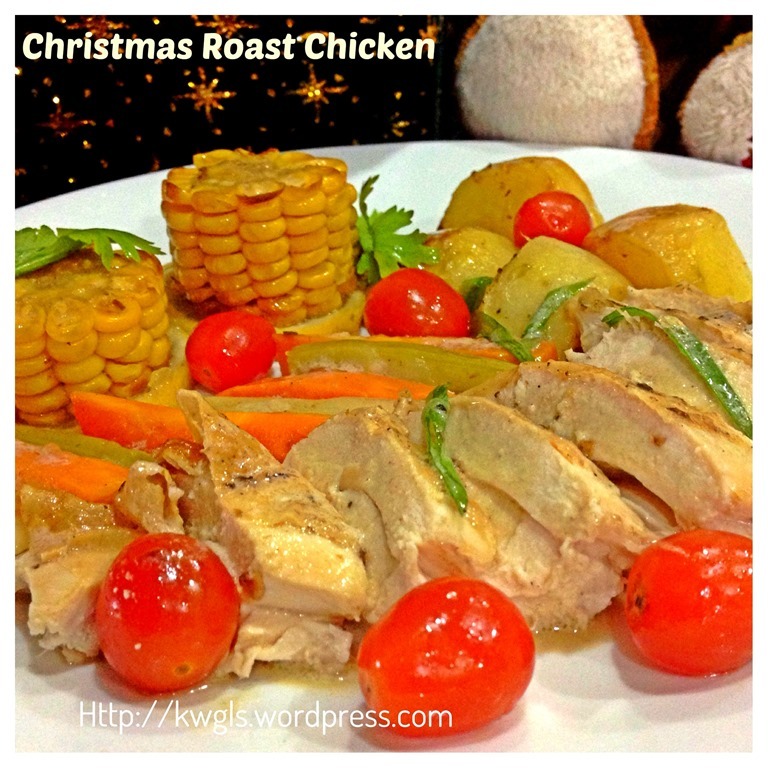 Some readers may want to “practise/test” the recipe before they formally cooked and served their guests during this important Christmas dinner. 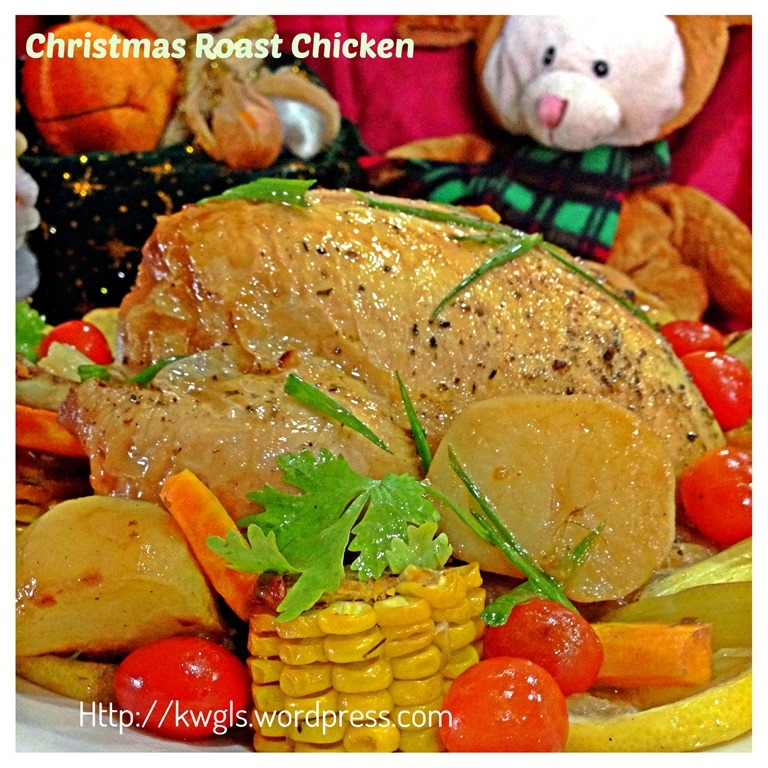 This roast chicken recipe is very simple and fast and the result is a CRISPY skin and JUICY chicken.. No long marinating required (unless you preferred) and no exotic ingredients.. What I am sharing is the basic recipe of chicken roasting and readers have full flexibility on the marinating the bird and the sauces to go with the roast chicken. Fresh herbs or dried herbs such as thymes, rosemary, oregano, parsley etc..
Pre-heat the oven to hot 220-230 degree Celsius. 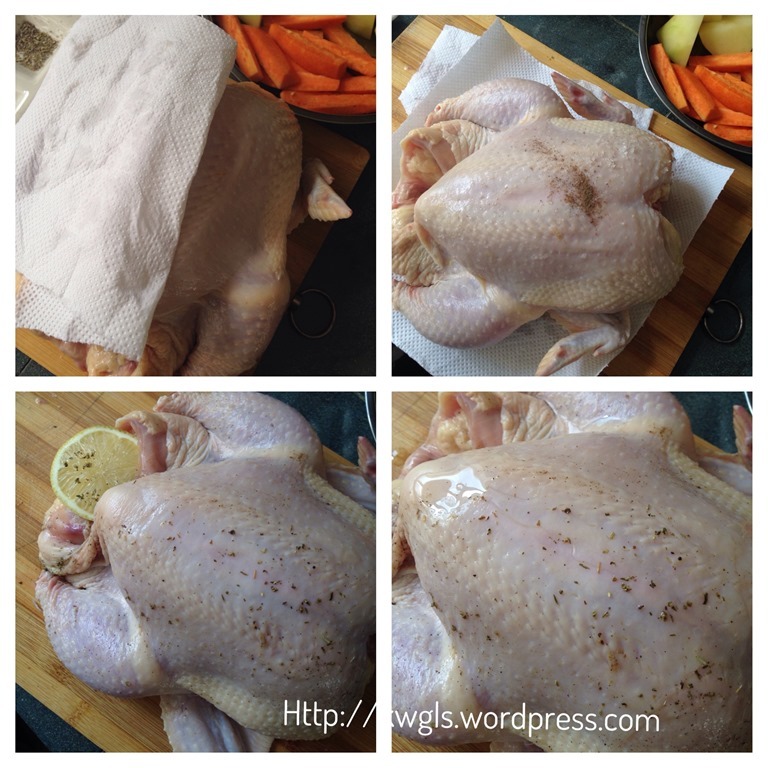 Clean the chicken thoroughly, cutting off any excess fats in the cavity and use the kitchen towel to pat dry the bird. Rub the chicken with olive oil, salt, black pepper and any desired herbs. (Note: Instead of using olive oil, you can keep the chicken fats or use butter slices and insert between the skin and the meat throughout for the entire body). If you prefer, you can marinate the chicken for a few hours. Alternatively, you can put the seasoned chicken in the fridge uncovered for 1-2 hours (air dry by the fridge). However, all these steps are optional and in my humble opinion, not necessary at all. If preferred, put in the vegetables and herbs in the bird’s stomach cavity. (I have put lemons, carrots and celery sticks in the cavity). You can consider stitching the chicken cavity with some linen threads if there are a lot of vegetables to be stuffed. 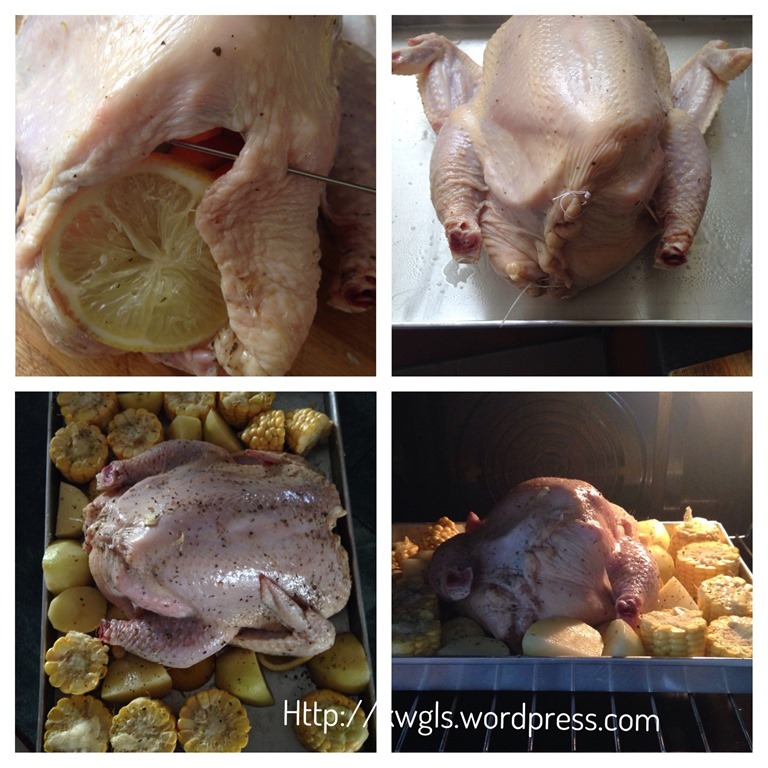 In the baking pan, place the chicken with the breast facing up. Put all other side ingredients such as sweet corns or potatoes on the side. Drizzle the vegetables with olive oil (or rub with butter) and sprinkle with preferred seasonings such as salt, black pepper or herbs. Baked in the oven at 230 degree Celsius for the first 15 minutes and reduce the temperature down to 180 degree Celsius and baked for additional 30-45 minutes more depending on the size of the chicken. The most scientific way of testing whether the bird is cooked is using an oven thermometer inserted into the inner thighs (touching the bones) and register about 80 degree Celsius. When the inner temperature reaches 80 degree Celsius, the bird is considered as cooked. Remove the bird from the oven, let it rest for half an hour before putting in the serving plate or cutting (carving) into smaller pieces for servings. Best go with sauces such as orange apricot sauces, black pepper mushroom sauces and etc.. It is not a difficult recipe at all. You may want to try making this at home first to test the recipe. 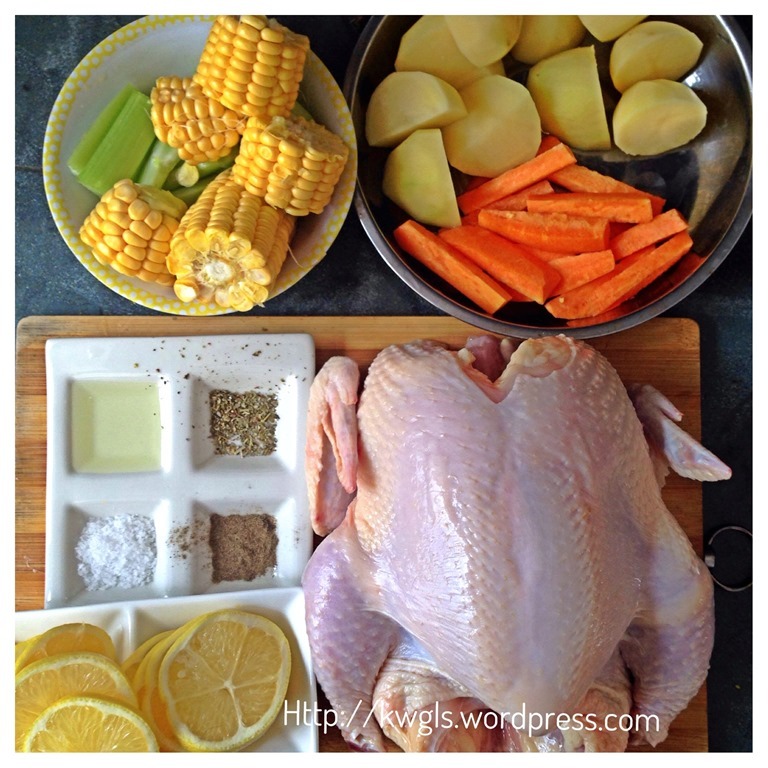 In order to avoid getting burnt, over cooked and maintain the juiciness of the bird, I would advise readers to get a small oven/cooking thermometer. That is the more scientific way of knowing whether you bird is cooked and provide you with the beautiful, golden brown and crispy bird. 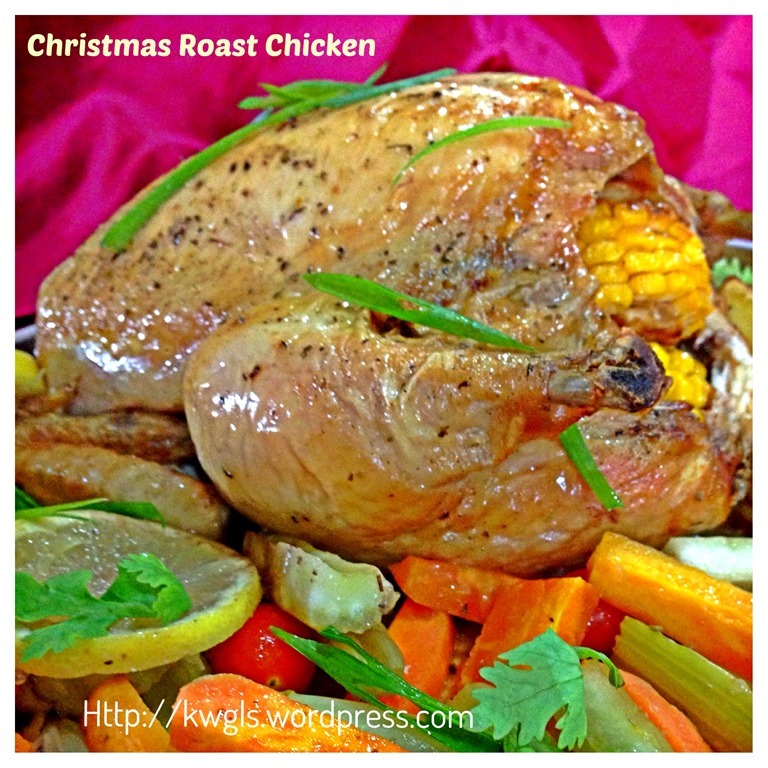 If you have a lot of guests, it make sense for readers to roast 2 birds at a time. 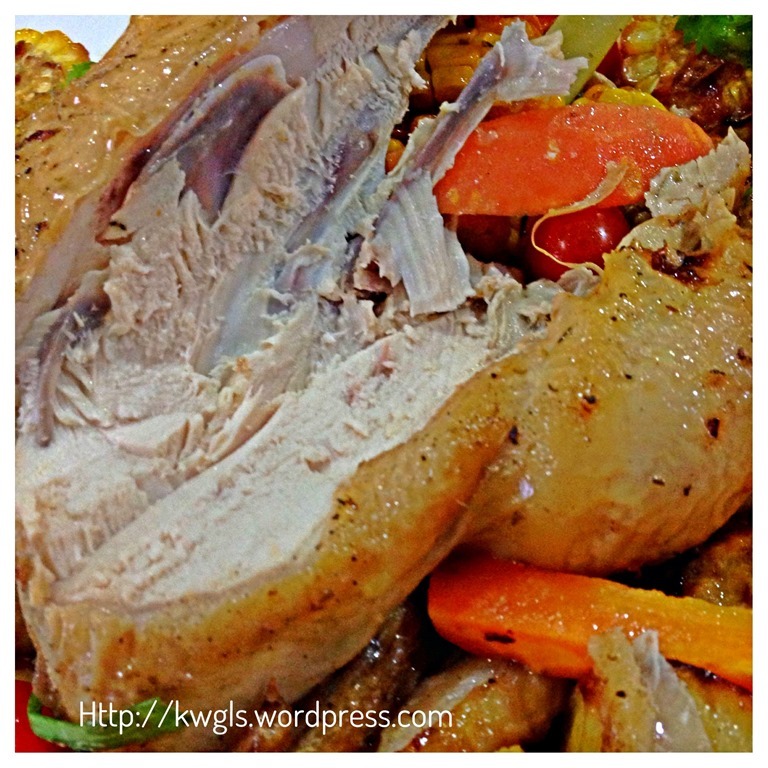 If you cannot finish the bird, use the meat to make into sandwiches or fried rice on the next day. As for the birds’ carcases, boiled with some water to make it into chicken broth which can be used for soups or porridges. For more recipes, you can refer to my RECIPE INDEX here and you can follow me or save your recipe using PINTEREST or visit this blog’s FACEBOOK PAGE . 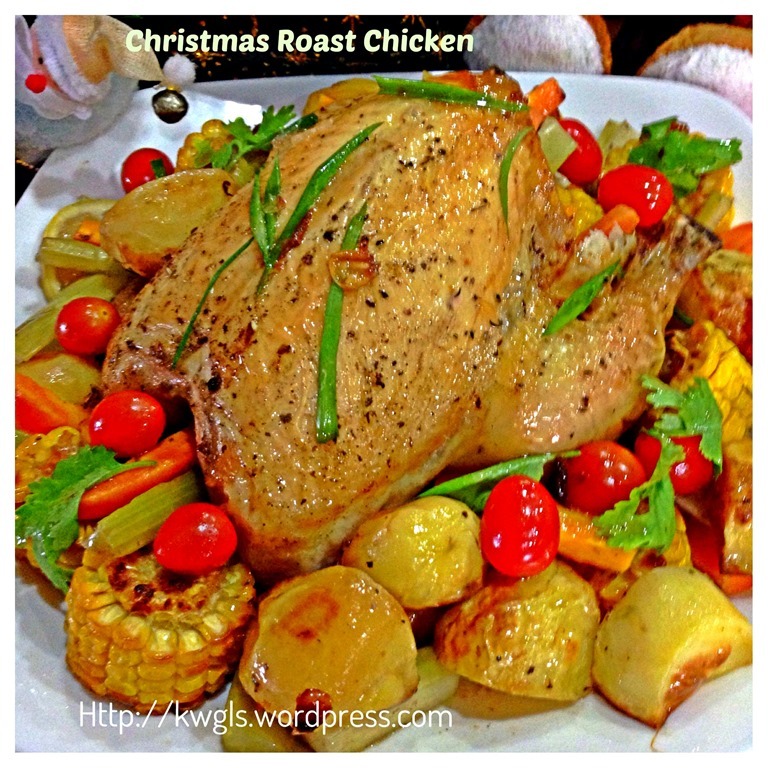 This entry was posted in Christmas 2013, Dish, Food Preparation Series and tagged 8, Christmas Roast Chicken, Crispy Roast Chicken, Easy Crispy Roast Chicken, GUAI SHU SHU, Guaishushu, postaday, Roast Chicken. Bookmark the permalink.